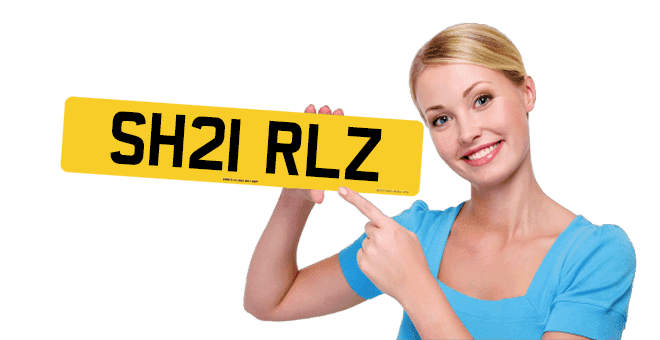 Personal Car Registrations can be described in a variety of different ways – personal reg plates, private number plates and cherished number plates to name but a few! In politically correct Britain a car registration number is the combination of numbers and letters that is assigned to your vehicle so that it has a unique identity. On the road this sequence is displayed on the number plates which are now made from an acrylic (plastic) material and firmly fixed to your vehicle. Car registrations have been issued to vehicles since 1903 in carefully planned sequences or series. When all the available combinations in each series were allocated, then a new series was issued and the Government soon realised that it would also be useful if the series gave some indication of the age of the vehicle. Our records thus tell us where and when a plate was issued and what combinations exist from which you can select your private plates. Starting with A1 and moving up through the sequences to YYY 999 it became necessary to add a letter to the end of the number plates in 1963. This letter became the significant ‘year indicator’ and the plates were called suffix car registrations to describe this. Thus in this year the new series began with AAA 1A.Each year gave rise to the next letter of the alphabet although the letters IOUQ and Z were never issued to avoid them being mistaken for numbers or other letters which looked similar. Is was probably not until the late 60's that fashion-conscious Britain conjured up the idea of car registrations becoming a personal item. People started making enquiries of what was then the Driver and Vehicle licensing Centre (DVLC) and their local county councils to see if they could move car registrations between vehicles. As soon as this request was legally granted the personal car registrations business began as a natural progression from people's desire to have the car reistration of their choice on their own motor car. They also began asking for the same transfer service when they changed their vehicles so that they could move their personal plate across to it. At that time people were much more interested in their Jaguar E Types and Minis than the number plates they displayed so unfortunately many excellent car registrations have gone to registration mark 'heaven' when the cars were scrapped (never to be re-issued). By 1983 this series was used up and so the ‘year indicator’ and numbers were moved to the beginning of the plates to start the prefix car registrations series, starting with A1 AAA. By September 2001 it was necessary to begin the latest ‘current-style’ car registrations series which effectively stopped the use of letters to indicate a vehicle’s age. Nowadays the new number plates begin with a two letter area indicator code followed by a two digit number indicating the age of the vehicle, followed by a three letter combination made up of random letters. TT53 FAB is an example of a current style car registration. We have sellers of all the types of registration marks mentioned above. To start searching now just use the "Find Number Plates" link at the top of this page.